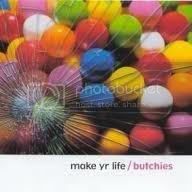 The Butchies are a Lesbian and Feminist band from Durham, North Carolina. Made up of guitarist and frontwoman Kaia Wilson, bassist Allison Martlew, and drummer Melissa York, the band has been performing together since the recording of their first album, Are We Not Femme? in 1998. Since then, the trio has recorded three subsequent albums, Population: 1975 in 1999, 3 in 2001, and Make Yr Life in 2003. In 2005 the band announced a “hiatus”.